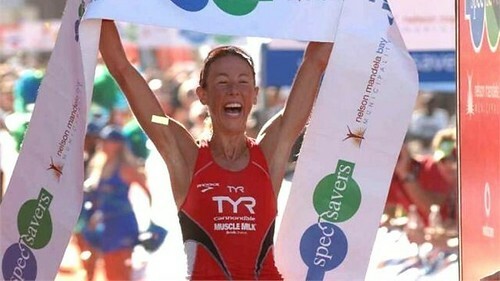 Three-time World Ironman Champion Chrissie Wellington took Ironman South Africa by storm on Sunday in Port Elizabeth. Wellington put on yet another impressive record-breaking performance by shattering the Ironman South Africa bike, run and course records, to finish in a time of 8:33:56 and in the process record the all-time fastest women’s time for a sanctioned Ironman event. In bettering the previous course record by an enormous 42m:36s, Wellington’s time was also good enough for an eighth-place finish overall. Wellington exited the water in 51:40, which left her 2:45 in arrears to swim leader Amanda Stevens of the USA (45:55) and only 0:34 back to her fellow compatriot, Rachel Joyce (51:06), as she hit the beach. However, the 34 year-old then made quick work of eliminating her deficit and disposed the leading pair in the opening kilometers of the bike. In typical Wellington fashion, she increased lead with every pedal stroke. In wiping out Natasha Badmann’s Ironman South Africa bike course record of 4:45:23, Wellington managed to build up an insurmountable 16:51 advantage over her closest rival, Rachel Joyce, and greater leads over Belinda Granger, Stevens and Diana Riesler as competitors entered the bike-run transition. After the damage she inflicted on the women’s field on the bike, Wellington set out on a blistering pace for the three-lap run course, eventually crossing the (marathon distance) finish line in a time of 2:52:54 – the fastest run split of the day for both the men and women’s fields. Her remarkable time of 08:33:56 was significantly quicker than the previous women’s world of 08:36:13 set in November 2010 at Ironman Arizona. “I am so incredibly thrilled with the result of the Spec Savers Ironman Africa. To get the victory, and break the World Ironman Record gives me a huge amount of pride and satisfaction, but more importantly it causes me to rethink what is humanly possible for both myself and others in endurance sports.